Vegetable soups are great favourites regardless of the season and they can be a terrific way to use up those odds and ends in the fridge! This mouth-watering recipe is very easy and healthy as just one serve provides more than half your daily recommended serves of vegetables. And don’t forget about all the dietary fibre! It’s also versatile as you can use whatever low FODMAP veggies you like and perhaps use what’s seasonal, cheap or growing in your garden. 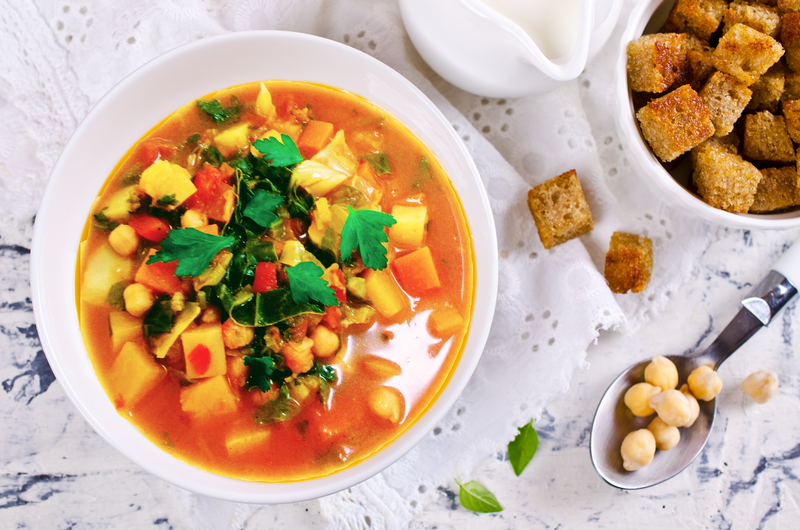 Also, if you are craving some legumes in your diet this soup recipe allows low FODMAP amounts. Heat the oil in a stock pot and sauté the leek leaves until they start to caramelise. Add the water, pepper and tomatoes and bring to the boil. Add the vegetables in order of their cooking time. That is, add the ones that take the longest to cook first. So add swedes and simmer for 5 minutes before adding potatoes, carrot and pumpkin and cook for a further 10 minutes. Then add cabbage, red capsicum and chickpeas, cook again for about 5 minutes and lastly add silverbeet and parsley and simmer for a further 2 minutes. This recipe uses lots of fresh vegetables! However many other low FODMAP veggies can be substituted like parsnip, turnip, spinach, kale, eggplant and zucchinis. Remember to check out the serving sizes recommended in our Monash app and use veggies that are seasonal and cheap!